St. Brigid of Ireland | Feast! 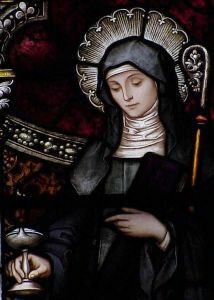 February 1st celebrates the Feast of St. Brigid (c. 451-525), a nun, abbess, and friend of St. Patrick’s in early Christian Ireland. St. Brigid founded the monastery of Kildare where the Book of Kildare, an illuminated Gospel manuscript was created. The art historian in me needs to follow a brief tangent to say that according to 12th century writer, Gerald of Wales, this manuscript was so wondrous that he believed the illuminators were assisted by angels. The Book of Kildare has since been lost but would perhaps have rivaled the Book of Kells in intricacy and beauty. To celebrate this patron saint of Ireland, I made “St. 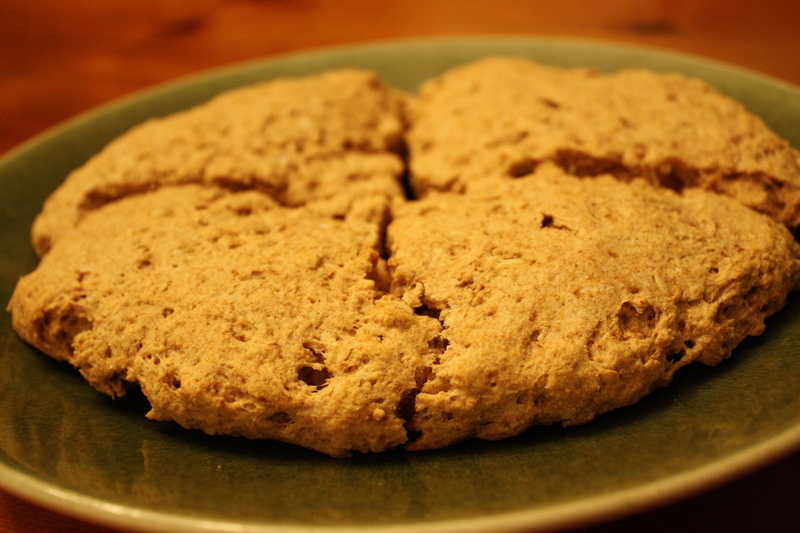 Brigid’s Oaten Bread” from a recipe I found on the Catholic Cuisine blog. I used 3/4 whole wheat flour and 1/4 spelt flour and it turned out great. It was so simple to make! 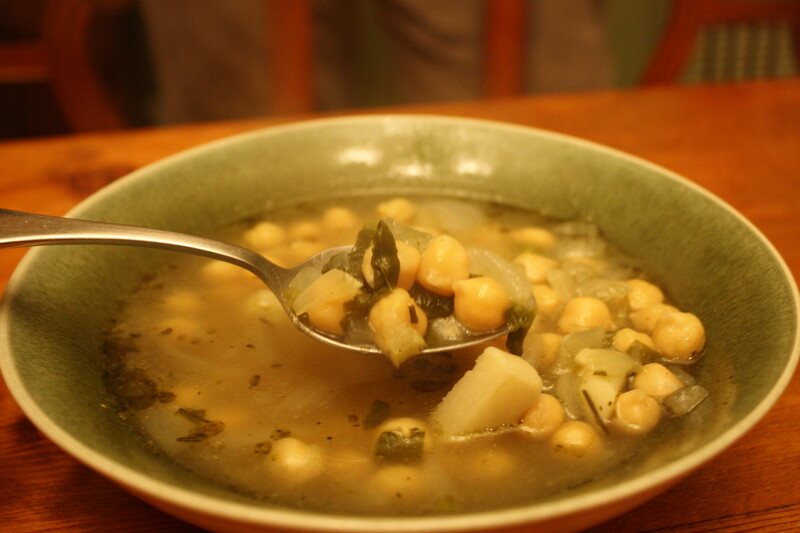 We paired the bread with a simple chickpea soup inspired by a recipe in Twelve Months of Monastery Soups by Brother Victor-Antoine d’Avila-Latourrette. I made some substitutions, simplified, and added some seasonal veggies we already had. Directions: Sauté the onion in olive oil then add the other ingredients. Bring to boil then cook for an hour. Daniel concocted our favorite supplement to a dinner of soup and bread: honey butter. It makes a simple meal into a treat. We even used our green dishes! This entry was posted on Tuesday, February 1st, 2011 at 9:01 pm and is filed under St. Brigid. 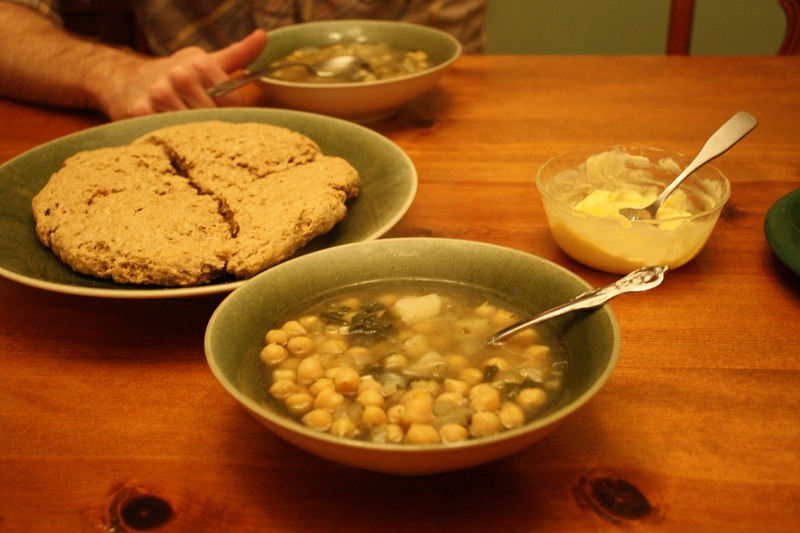 Tagged: Chickpea Soup, Irish Oaten Bread, St. Brigid. You can feed this entry. You can leave a response, or trackback from your own site. Repost of last year’s Feast of St. Brigid at our house!